Find out how Maître’s ICO referral platform helped Current become the buzziest Initial Coin Offering (ICO) of 2018. Current is a new app that lets users access all their favourite streaming services from the same place. 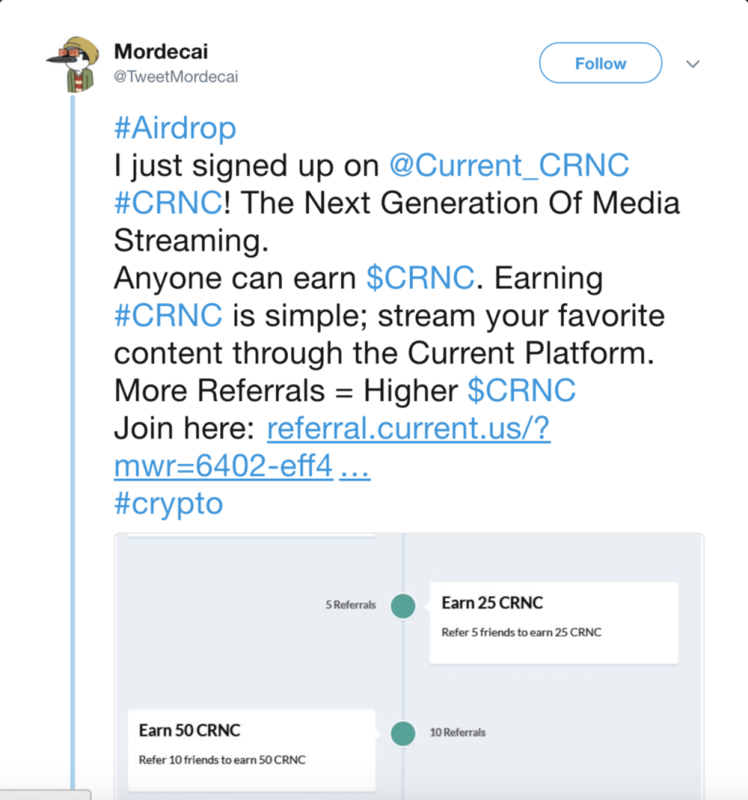 It employs a cryptocurrency – called CRNC – that rewards members for streaming via Spotify, Apple Music, YouTube and other popular services. In return for their time, money spent and data shared, the user gets currency to spend on premium streaming subscription services. By the end of its ICO on February 7th, Current had reached its goal of selling 350,000,000 CRNC tokens. In the process, it raised $36 million and earned a hype rating of Very High on ICO Drops. As we’ll see, a referral scheme powered by Maître’s Viral Lead Magnet played a central role in making this possible. Getting tokens to sell like hotcakes in an ICO is all about building buzz and gaining trust. One of the best ways to do both these things at once is referral marketing. By getting an affiliate to share your marketing content, you can simultaneously reach more leads and publicly demonstrate the affiliate’s trust in the ICO. These objectives have been at the top of Current’s list when they set up their ICO referral campaign using Maître’s Viral Lead Magnet. Their approach earned them 636,000 subscribers (and counting) in the lead-up to the ICO. What is even more impressive is that 91% of these were referred!! Let’s go through the process Current used to achieve this. From the homepage you get a clear call to action (CTA), it is simple and enticing. Once the user clicks ‘Join Now’ they are taken to another page on the site. Simplicity is crucial to this webpage’s success, and we can see it at work in both the copy used and the signup process itself. 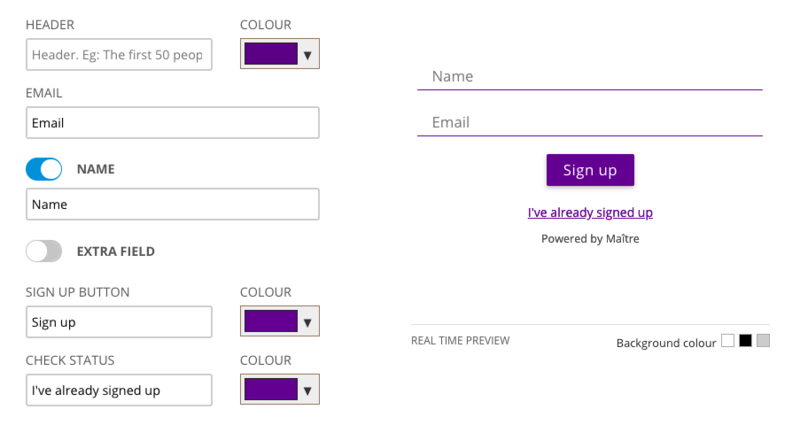 The lead can clearly see that initial signup is going to be simple, with just two fields (Name and Email) to fill out before they click the sign-up button. This increases the likelihood of them going through with the signup. The value proposition is clearly explained on the page. They have two sections which contain a bullet list reasons Current is the next big thing. The offer it sold in the most straightforward terms possible: “Refer friends to Current and, get up to $100 in free credit”. Having a simple to understand offer is almost one of the most important elements to the campaign as most people don’t have time to wonder what the hell it is they have been referred to. In Maitre dashboard it is super easy to set up all of the copy, you can control every element of the landing page. Remember, the first aim of any referral page is to get them to perform the first action, i.e signup. From this, we now have a way to contact them directly to begin to push more marketing messages, like, refer more friends and get X. Once the lead has signed up, the Current website taps into Maître’s Viral Lead Magnet Technology to show the user the following referral offer details. All of this comes out of the box with Maître. Call to action (CTA) – the most important element of the whole campaign and, one that is crucial to your signups making their referral. Referral tally – when the affiliate revisits their referrals account they’ll be able to see their live referrals tally here. 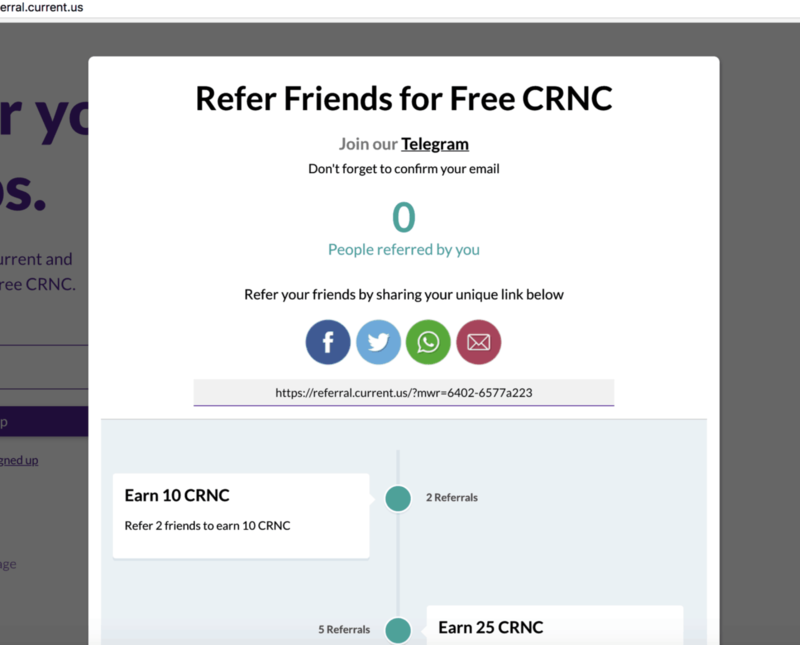 Telegram group link – take a look right at the top of the screenshot showing the referral link and benefits view. 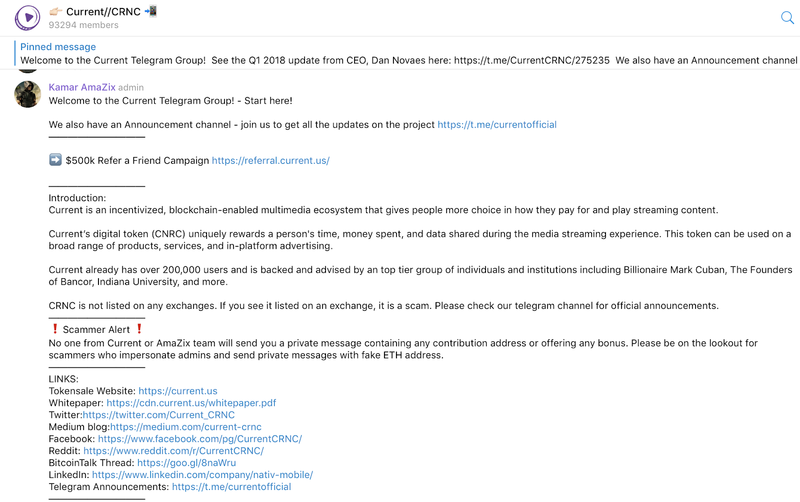 You’ll notice a link to Current’s Telegram group, just beneath the title. This is an important part of how Current has built a sense of community around their referral scheme and placed useful feedback within reach of their affiliates. The Current affiliates group is currently the #1 group on the Telegram platform – a powerful signal of its success. Social sharing buttons – Telegram, Facebook, Twitter, Email and WhatsApp buttons enable subscribers to share a rich version of their affiliate link on social in just two clicks. One click loads a post of the link on the relevant social account; the second click sends the post. Unique custom referral link – this is the key mechanic of the referral process. Each affiliate gets a unique referral link to share with their network. Whenever someone signs up after using it, the affiliate progresses towards earning a cryptocurrency incentive. To encourage sharing, we’ve made it as easy as possible for the affiliate to copy the link to their clipboard. All it takes is a single left-click. 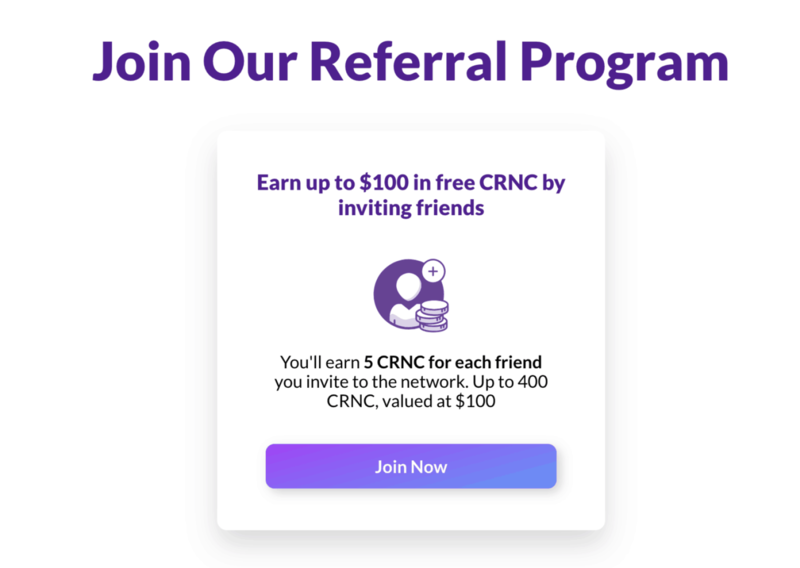 Referral incentives – Current motivate their affiliates to make referrals by offering incentives, in the form of various quantities of their own cryptocurrency, CRNC. The affiliate can see how many referrals they need to make to earn each level of incentive, with the rewards getting greater as they work harder. The range of referral levels represented – from just 2 to 80 – is designed to appeal to a wide range of people, from casual users to full-time affiliate marketers. “The Current campaign is a perfect example of how clearly communicated incentives can drive referrals through the Viral toolset”. “Current’s referral scheme centres around a great B2C offering: a currency that can pay for best-in-class streaming services. On the one hand, this is motivating for both regular users who want to save money on their streaming services. On the other, it appeals to affiliate marketers who see an opportunity to make high numbers of referrals and accrue currency. With incentive targets ranging up to 80 referrals, there’s scope to make an excellent return on a well-positioned link. Current made use of Maitre’s automated engagement emails. As soon as users sign up they get a series of emails which help hit home what a user can achieve if they refer friends to the ICO. They also get automated emails if they successfully refer someone or if they hit milestones set by the Current team. We find that those who incentivize in this way on average increase their referral rate by 20%. A key component of Current’s campaign was to drive users to their Telegram group so as they would be able to message users and, promote their Airdrop. For this, they were able to utilise Maître’s fully customizable widget which allows for hyperlinking of text to drive people towards the channel. Be really clear about what you want them to do. Here is an example of how Current do it. Automate this by using a bot to make daily broadcasts to your channel, this way you can reduce the amount of time needed to manage the process. Use community managers to carry out the day-to-day contacting required from questions which appear from the community. If you keep getting the same questions asked like, ‘how do I get my CRNC?’ then automate this as well. Emulating Current’s referral marketing technique takes a good amount of planning and/or consultation. How will you incentivise referrals? Will you use community tools like Telegram to support the process? How will you optimise your referral link content for social media? Once you’ve got the details mapped out, technical execution on your site can be achieved in the space of minutes, using Maître’s Viral Lead Magnet. To learn how, book a meeting slot here.